Deeds' deficit is almost entirely based upon the most recent poll at this point, in part due to our methodology and in part due to the spread of the most recent survey. 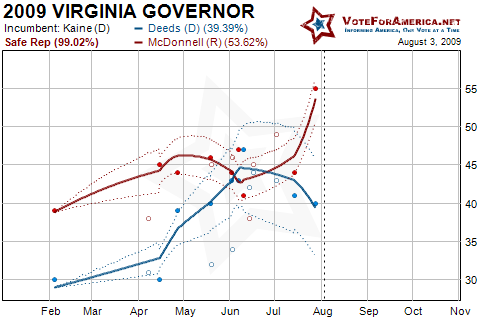 Both of these factors may be artificially inflating McDonnell's lead. The SurveyUSA poll is in all likelihood an outlier, but our model doesn't know the difference; the most recent poll receives the most weight. The SurveyUSA poll may also be at fault; the sample appears to skew toward people who voted for McCain by about 9 points, but Obama won Virginia by 6 points last November. This demographic discrepancy would explain the sudden drop in support for the Democrat, or it could indicate that many Obama voters don't care to participate in the off year election as SurveyUSA screens for likely voters. 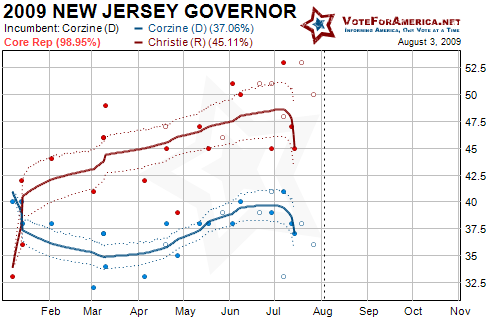 WNBC-TV's Brian Thompson reported last night that South Jersey Democratic Leader George Norcross wants Corzine to drop his re-election bid so that the party can replace him on the ballot. Some Democrats are worried that Republicans might win their first statewide election in a dozen years. One Corzine advisor acknowledged that he has heard talk among Democrats about the governor changing his mind about re-election, but says that Corzine is not considering a withdrawal. There are several possible replacements in the hangar and some pollster appears to be conducting a what if replacement poll for Corzine.